This is the one year anniversary of this blog! Happy Anniversary to www.within4hoursreach.com ! I have enjoyed sharing the pictures and some of the experiences of the past year. I hope that you may have found a suggestion or two and that you may have tried one of the fun outings within four hours reach! Opening Day with the Seattle Mariners! This night brought a tribute to Dave Niehaus as well as awards to Ichiro… all-time Mariners hits leader and other Gold Glove awards. Safeco Field has a new addition…The Pen, courtesy of Root Sports. They have opened up the pitching area so that there is no cage/wired barrier. This is a great place to view the game. There are TV’s, great music playing, a fireside lounge, a historical journey showcasing “The Sheriff” Norm Charlton, Gaylord Perry, Randy Johnson, and others. There is an additional bar that serves cocktails and new restaurants, like the Flying Turtle (Slow Cooked Beef Torta, Braised Pork Torta), Hamburg & Frites, and La Creperie (Strawberry crepe…you can skip this), and APizza (White Pizza…this has broccoli on it…fyi). After trying all three of the pizza options, definitely go for the pepperoni. There is also a M’s store called Good Stuff. Nice! I am starting a diet this week as we took advantage of it being opening day. 🙂 As it was opening night, they have some work to do. The menus do not contain the ingredients…so ask what is on it before the guy says “with everything”. Also, the scoreboards were not quite up to par as they indicated scoring from the day before and earlier in the day…so not accurate. We were sitting in section 108 so we were able to text @msbeervendor for personalized service, as he was donating some of his tips to the Japan relief fund… #36. Those serving the beverages are now wearing neon green shirts – I like it! Was that the longest 4th inning in Mariners history? I don’t know, but it felt like it. Although there was a loss this evening, I still recommend going out and supporting the M’s and enjoying the good ‘ol American pasttime…baseball. 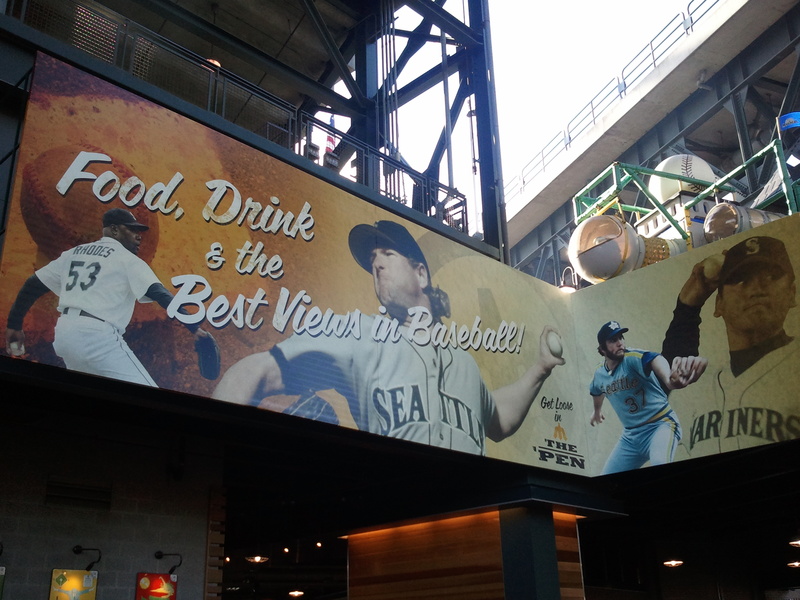 Safeco Field is top-notch! UPDATE June 2011 – still a nice experience…but, they removed much of their beer selection from The Pen. So, if you want Snoqualmie Amber or others, you will need to find it elsewhere in the park. It looks like they are mainly carrying the “big” boy brands. Bummer, as it looks like they did it again…you have a good thing and they screw it up by changing it.